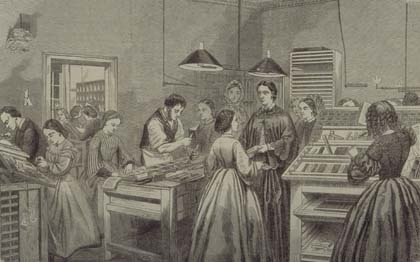 The English Woman's Journal was one of the most important Victorian periodicals for women, published by the Langham Place circle of activists, and printed by Emily Faithfull's Victoria Press. The editors - Matilda Hays and Bessie Rayner Parkes (1829-1925), the future mother of Hilaire Belloc - deliberately set out to create a serious feminist magazine. 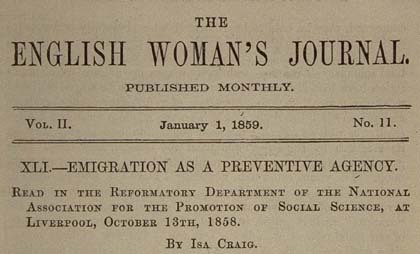 The monthly issues included substantial articles on employment (in 1858 recommending 'lecturing' as the only significant growth area for women), education, home and foreign projects, but also provided space for an unusually wide range of book reviews, especially fiction. Parkes reported that it was slow work at first, but by November 1859 the journal had a regular circulation of 700 copies.